Pre-heat the oven with convection heat to 100 °C. In a small pan bring the milk to the boil with the vanilla pulp scraped out of the pod (add the pod for added flavor) and the grated tonka beans. Switch off the oven and let it steep for half an hour. For the best result, steep the spices overnight in the milk. This intensifies the aromas many times over! Add half the lime peel and stir. Whisk the egg yolks and the sugar with a small hand whisk in a bowl but don't whisk the mixture too much. Stir in the cream, but don’t let it go frothy. Then add the spiced milk. Pour the mixture into the Mini-Cocottes and leave without a lid in the oven for a good hour. 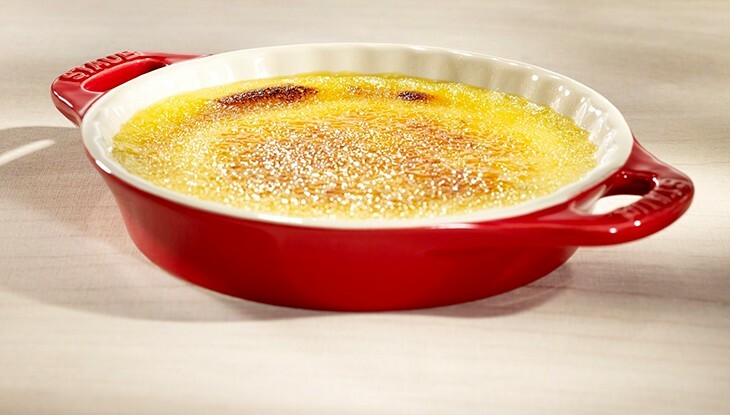 At the end of the cooking time the crème in the middle should move slightly, but no longer be very liquid. Allow to cool. Cover with cling film and place in the refrigerator (it should be served nice and cool). Before serving, sprinkle with a thin layer of powder sugar and then immediately caramelize with the kitchen torch, or if you don't have one, under the oven grill. The sugar layer must be very thin to create a fine caramel layer. For a finishing touch, sprinkle with the remaining lemon peel. Very refreshing!